View Edmund Khong's Profile here. "On behalf of the Microsoft recreation club, we thank you for the wonderful services that were rendered. We have received a lot of positive feedback from parents. It has been cited as one of the best ‘family day/bring a kid to work” event ever held.” -Microsoft Singapore. "The kids had a great time and we had many GREAT reviews from both the children and the parents.” -Organizing Vice-Chairperson, Microsoft Singapore. "SUPER Kids Entertainer! 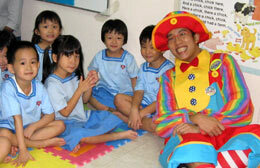 I have never seen anyone who does a better job at entertaining children.” -Mr. John Tan, Social Events Organizer. "Professional and top-notched entertainment for the family. I will definitely recommend you to all my contacts.” -Mr. Jeremy Lin, Event Project Manager. "... great performance shows with passion and all my clients really appreciate your professionalism and interaction with the audience.” -Gwen Tan, Director, The Voice. "The Modern Piped Piper of our times! The children are so delighted and mesmerized by your performance.” -Mrs. Tan, mother of 2, at NUSS Kent Ridge Guild House. "You were great and all the children enjoyed themselves very much! I must have you over again to perform for Jon's birthday in 6 months time!”–Lara, Mum of Crystal, 6 yrs and Jon, 4 yrs. "Captain Dazzle, you are very funny! Can you please come to my party too next month?”–Betty, Sister of birthday boy Xavier, 6 yrs. "The kids loved your rabbit! They are still talking how you magically changed the balloon into a rabbit after 6 months!” -Mr. Fernando, Dad of Sierra, 7yrs. 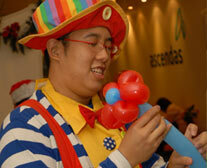 A professional performer, Edmund has studied the art of clowning in USA under world-famous mentors. As 'Bubbles' the Magic Clown and 'Captain Dazzle', Edmund has set himself apart as a unique personality and conjures his own unique brand of entertainment for children and family. 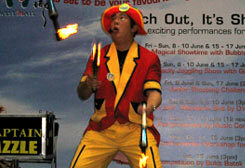 His amazing range of skills includes physical comedy, clowning, magic, juggling, ventriloquism, balloon sculpturing, fire acts and stunts. To date, he performs over 320++ shows every year at hotels, clubs, condominiums and shopping malls and constantly seeks to reach new heights in this field. He’s a proud member of the WCA (World Clown Association), COAI (Clowns of America International), IJA (International Jugglers Association) and the IVA (International Ventriloquists Association). Edmund has been featured on Channel U "News Club" on his success in the field of children's entertainment business. He has appeared in national newspapers over 6 times in year 2007 alone! In 2007, Edmund Khong also led the the official balloon sculpturing team that broke the Guinness World Record of the Most Balloon Hat Wearers. Drawing from his vast experiences on performances and events, Edmund also specializes in designing customized entertainment for your event needs and directs most of the projects here at Star Dazzle Concepts. Captain Dazzle - Children's Magic Show with live rabbit appearance! 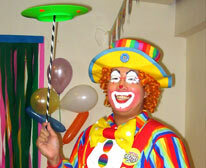 Showtime with Bubbles the Magic Clown! © Star Dazzle Concepts 2007. All Rights Reserved. Another production by Whatz Next.